This summer I have the great pleasure of cycling through Oxfordshire country lanes to get to work in the publishing archives that share a building with the Museum of English Rural Life, over the Berkshire border in Reading. I’m being immersed in English country sights, sounds and smells, and am enjoying it no end. (It hasn’t rained much on me, yet.) So the next five weeks of podcast script catch-ups from Really Like This Book will be about nature writing. 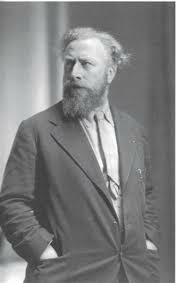 Today’s is the story of a leisurely punt down the River Thames by Robert Gibbings, an Irish artist and naturalist who was a book designer before the Second World War, and after the war became one of the first British nature presenters for the BBC, the forerunner of David Attenborough. He belonged to a vigorous, manly, hedonistic artistic circle which included the scandalous sculptor Eric Gill, and he ad at least two families of children. 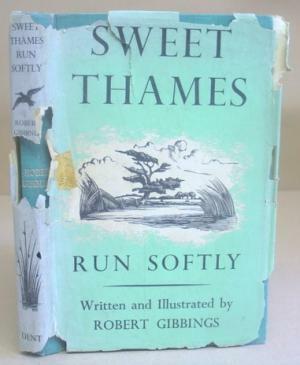 The title of his book, Sweet Thames Run Softly (1940) is a line from a poem by Edmund Spenser from the 16th century. That’s a pretty good indication of the timelessness of this book, and the timelessness that Gibbings was experiencing when he took his journey. He and some friends built his punt themselves, with no knowledge of boat-building but with good advice from the builders’ yard down the river. It had lockers and a canvas cover to keep the rain off and the chill out, to be Gibbings’ temporary home for several weeks as he worked his way from the source of the Thames in the Chiltern Hills, down to Windsor Castle. Gibbings has so many interests that the journey is a slow one, constantly interrupted by his examination of anything that catches his interest. So the book ranges wildly over most of natural history: from geology to insects to fish to birds to people and to beer. He also tells stories: my particular favourite is the tale of what happened when a zoologist colleague gave him a cigarette tin full of dried South African mud, left over from an expedition he had completed two years earlier. Gibbings put the tin in water, and inspected it every few days, and was amazed and greatly entertained to witness several generations of pondlife and microscopic activity being born, living, dying, sedimenting to the bottom, and feeding in turn new insects and tiny water creatures, that eventually brought about the growth of plants. It wasn’t so much an experiment as seeing the life cycle of plants and animals speeded up. We also get little outbreaks of poetry and Sir Thomas Malory, and we get a lot of local colour. Dialogue and conversations are recorded as Gibbings encounters odd or interesting people along the river. He does seem to keep meeting girls. There was a naked one swimming in the river during heavy rain, whom he tries to encourage to climb on board the punt for a cup of tea, but she wisely diverts his attention from what she might look like out of the water, by asking him to run down the riverbank to fetch her clothes. When he returns, not having found them (obviously not looking hard enough), she’s on board, safely wrapped up in one of his blankets. They have a nice cup of tea and conversation, but when she wants to leave, she does it again: she asks him whether that little brown bird at the fork of the old oak tree over there is a tree-creeper or a nuthatch. That was an inspired question to ask anyone who prides themselves on their bird knowledge, because easiest to work it out by looking at whether the bird is creeping up the tree trunk, or downwards. While Gibbings was looking carefully for the bird on the tree (which undoubtedly didn’t exist), the naked girl disappeared over the side of the punt and got away cheerfully, dignity and anonymity intact. There was another girl whom Gibbings did not actually approach, but ended up watching though his binoculars because of her situation. She’d marched past him at a fast pace, clearly upset and clearly at the winning end of an argument that she had hoped would go in a different direction. The binoculars came out when Gibbings noticed a very dejected boy sitting on the towpath in the direction from which she had come, looking as if the argument had not gone the way he’d wanted it to either. When the boy jumped up and followed the girl, and met her, and brought her back in a calmer frame of mind, Gibbings was still interested, but I’m glad he put the binoculars away when they entered the wood together. On another occasion he met a third girl, protected by a ferocious man-hating aunt, but she managed to get away one Sunday morning while the aunt was at church to thank Gibbings for getting her dog out of a trap. They talked about the country tradition of hanging dead vermin on a fence to discourage the others. That’s not something we see very often these days, though I did see a barn door in France once that was decorated with the hooves and tails of wild boar. Gibbings’ habit of moving from one story to another is infectious. He’s a very outdoor person, and shamelessly enjoys getting away from civilised routines. He eats and sleeps when and where he wants, and brings any creature that he finds into the boat for inspection. He once stayed for two weeks in a nudist colony, which sounds off-puttingly hearty, and also reliant on good weather. Everyone played good hard games energetically all morning, and swam in the lake morning and noon. Gibbings is endearing in his frank enjoyment of the body, and the briskness of nature, even when it extends to truly bizarre stories about killer duck attacks while mating in flight, or bird-eating rabbits. His stories about the wildlife in London parks are just as curious as his tales from Tahiti. His focus swoops in to hover at insect-scale, and then pulls back to consider the habits of badgers. A typical chapter will follow a train of thought mixed in with the view from the punt. Chapter 7 is decorated with a nice engraving of a Friesian cow grazing, and begins with thoughts about kingfishers and how some come to perch on fishing-rods. We move on to bird camouflage, and then fish camouflage, and the habits of the painted lady butterfly. 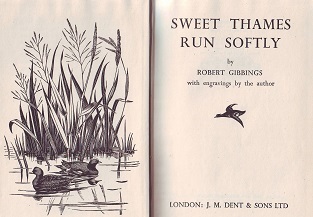 Gibbings then refers to one of his earlier nature books in which he describes the camouflage of the little owl, the green woodpecker, chrysalids and the red-crested pochard in Regent’s Park. Then we move up a scale with the greed of the heron and how it can be prevented from taking off by the sheer weight of its catch. This brings to Gibbings’ mind the heronry at Henley, their flights to Ireland and the legend of St Columba and the crane. Naturally this brings us to bird migration, and Gibbings’ experiences watching birds as he sailed from north-east England to Barcelona on a tramp steamer. These migrating birds had no fear of the boat or the sailors, and would invade the galley looking for food, and sit on the rail without concern, resting from the gales until the boat reached the Mediterranean. They cleared the ship of cockroaches, and brought out the nurturing spirit in the sailors’ hearts. The unfortunate death of a flycatcher brings to mind a story from Gibbings’ service during the First World War, when he was riding out on the moor in Cork, and saw seven golden plovers fly towards him, blown by a winter gale. Three of them dropped in a row as if shot, and Gibbings was at a loss to work out where the gunman had been, since he had heard no shot. The birds had been decapitated by the telegraph wire. Now that Gibbings is back in Ireland we get an Irish wildlife story, of Tom Raffery, the most classically educated failure of a priest ever, and his version of the story of Pan and Syrinx. Then we have the story of Lord Grey, with only one working eye, but who could memorise pages of classical history at sight, even though he couldn’t see the birds’ eggs in his garden’s nesting boxes. Lord Grey had written a birders’ book that Gibbings had illustrated, and so we hear about the multiple nest-building of moor-hens, and the dangers of even looking for a nest, since our trail will lead cleverer predators after us. All that is one chapter, and as you can see, it’s a right old jumble. But 24 chapters of this kind of writing is a glorious jumble, a total immersion in the wildlife of the Thames with many, many little diversions and tributaries. The edition I have is a new one, from a small press called Little Toller Books, which is absolutely beautiful, a pleasure to hold as well as read. 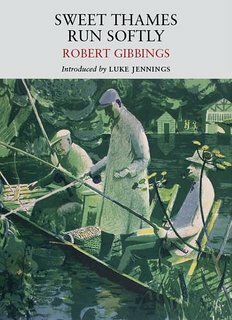 Gibbings’ own engravings decorate the chapters, and a really splendid painting, in lovely angular 1950s Stanley- Spencer style, of three men in sensible mackintoshes and flat caps fishing from a punt on the Thames, makes a perfect cover.